I love figs. Yummie, sticky, foreign bundles of goodness. The operative word there being: foreign. Growing up on the oh-so-tropical island of Ireland figs weren’t exactly ten a penny. Unless of course you count the dried or fig-rolled varieties, which don’t really taste the same. Instead, these were slightly strange looking yokes found only on Mediterranean summer holidays and in racy short stories by Enda O’Brien. So a few days ago when I was walking past my (now) local fruit shop in Sydney and spotted a whole tray of these little parcels of yum, I just had to get some. Once I got them home though I will admit, I was a little stumped about what to actually do with them. 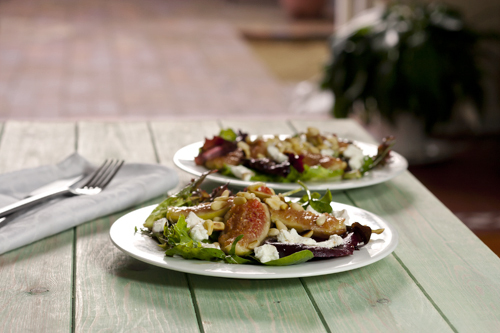 Enter the Avoca Salads book and an idea was born (or borrowed). As ever, I didn’t quite stick to the recipe. I tried to grill the figs to caramelise them and make them that little bit sweeter. I had this idea that they would get lovely griddle pan scorch marks on them and look really cool. They didn’t. But they did caramelise slightly and I served them still a little warm. I think it worked, The Fella certainly didn’t complain. So today is Anzac Day in Australia, a remembrance day for the Australian and New Zealand troops that served and died in the world wars. This is my first Anzac Day here and I find it a little unusual, being from friendly little neutral Ireland, I have nothing to compare it too. But I have been told that these little bikkies are part of the tradition and are super yum, and that’s reason enough for me. I was actually hoping to make chocolate hot cross buns for Easter but I had a fight with my yeast dough, which then sulkily refused to rise. 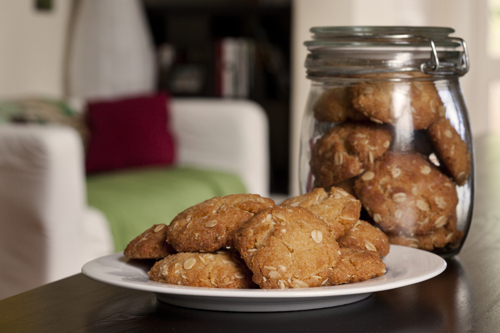 So yeast-free and simple Anzac biscuits won out in the end, but I’m glad because they are chewy, dunkable and a great (and equally unhealthy) alternative to chocolate after the choc-fest that was yesterday. Apparently to be a true Anzac biscuit, it must contain golden syrup, butter, oats, coconut and absolutely nothing else, especially anything that could be deemed “fancy”. The wives and mothers left behind would not have had access to anything other than the most basic and cheap of ingredients. I was told this by a proper ocker Aussie and I found it quite amusing as I imagine their counterparts in Ireland would have found coconut (even the desiccated variety) to be the absolute height of fanciness! Back at home I’ll quite happily have soup for dinner from Monday through to Thursday, especially during the winter. It’s so quick and filling and warm and healthy (kind of) and all-round delicious. And it can generally be made from whatever you have in the fridge, making it super cheap. Could there be a better combination of things for a midweek supper? But here in the Land of Oz soup just doesn’t suit the climate. That was until I was flicking through the lovely Rachel Allen’s Favourite Food at Home book and came across a recipe for coconut, pak choi and basil broth. It sounded pretty yummy. 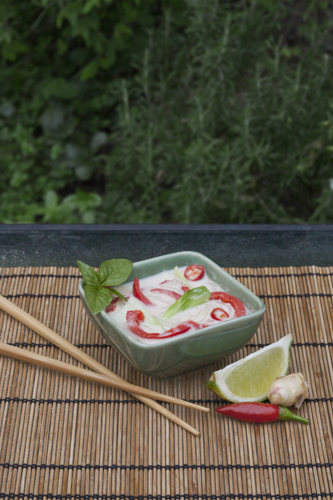 This Asian inspired soup is perfect for the Australian climate. It’s fresh, hot, sour and very light. I have adapted it slightly, throwing in some red pepper (or capsicum – look at me getting down with the lingo!) and vermicelli noodles just to make it a bit more substantial for a hungry supper. Otherwise The Fella would only complain loudly that I was trying to starve him. Chopsticks + noodle soup = big giant mess.